But things take a turn for the worse when one of them becomes infected and hovers on the brink of death. The friends throw caution to the wind and risk everything in their quest for a cureâ€¦ one which, for reasons unknown, has remained concealed for over two thousand years. If you likeÂ gripping action-adventure stories in an immersiveÂ world, then you will loveÂ the Aegis League series! Over 125,000 copies sold/downloaded &Â 1.8 million page-reads in Kindle Unlimited! This is a LIMITED TIME new release offer. Price returns to $6.99 soon! 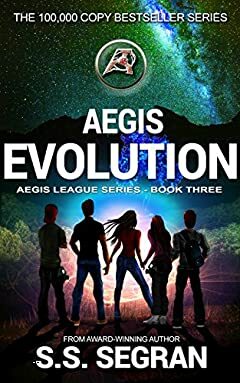 Join a rapidly growing fan base atÂ www.aegisnovel.com/insiderÂ and access Insider-onlyÂ material including free short-stories, giveaways and advance reader opportunities. SCROLL UP to orderÂ your copy today! Remember to subscribe at www.aegisnovel.com/insiderÂ for updates, short stories,Â giveawaysÂ and exclusive material from the author.